A dental cavity, if left untreated can lead to a dental abscess and furthermore to a large facial swelling. In the blog “Anatomy of a Toothache,” posted on October 28, 2012, we track the progression of a cavity. The bacteria associated with a pulpal invasion ultimately extend beyond the opening at the end of the root. When the bacteria traverse through the root opening, they enter an area called the peri-apical area. The result of this is often a dental abscess…this is infectious tissue (pus). An abscess can be very painful. Picture this: an object trying to expand inside of a cement block…expansion is almost impossible! An acute abscess can be looked at as a smaller version of this. The infection is trying to expand in the jaw bone which is like a cement block. The pain can be sharp, throbbing and shooting. The mere touch of the tooth can cause severe pain. Once the infection moves from the dense bone into the soft tissues, the result is usually immediate pain relief followed by swelling. 1. The Upper Jaw – Upper Jaw (known as the maxilla) – infections have been known to travel up to the eye and also into the maxillary sinuses. 2. Lower Jaw – (known as the mandible) – the infection can grow and close air spaces (called Ludwigs Angina), which can lead to suffocation. Or it can also involve the heart. By this time, the swellings have become life threatening. These extreme swellings are called an Osteomyelitis, when the bone is involved. When the soft tissues are affected, they are called a Cellulitis. In the next blog, we will look at how these swellings should be treated…until then. 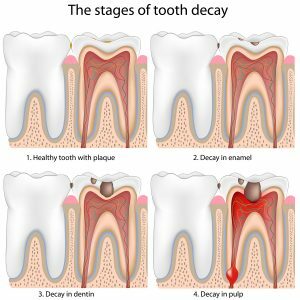 Posted in Blog | Tagged What Is A Dental Abscess?